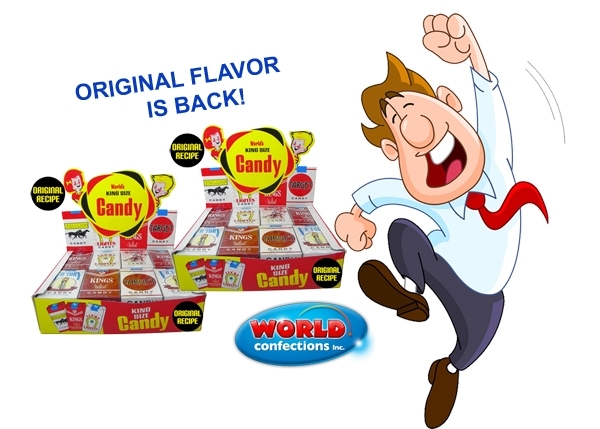 The Original World Confections Candy Cigarettes are Back, Baby! A change just happened. The magical kind of change that turns the clock back and sets things right with the world. The kind that happens when the people make some noise and ‘the man’ listens! And the proof, my friends, is in the pack. In fact, it’s in every pack of Kings, Lucky Lights, Target, Stallion, and oh yes – even Round Up! The Best Candy Gift for Baseball Lovers is Born! While we do love offering up pre-made candy gifts that catch our eye and happily end up in our inventory, we couldn’t help but crave the same sugar rush that came when we created our popular Custom Candy Bar Box. We loved the satisfaction that came with offering gift-givers everywhere an opportunity to personalize a truly awesome present for just $25, and from the first day it was available on our site, you showed us that you loved it, too! While our Custom Candy Bar Box is still a favorite that excites us, we wanted to feel the pure adrenaline of something brand new. What can we say – we’re candypreneurs! And, we came up with just the thing, at the exact right time. The latest homerun at Blair is our Can of Ball Park Treats – currently on sale for just $24.95! We start with a gift-worthy, generously sized paint-style can, with a label that hints at the tremendous selection of treats inside. Then, working with only the finest, freshest baseball candy and snacks, we fill that tin to the brim with about 59 wrapped goodies! These include: 2 Bags of Planters Peanuts, 2 Bags of Cracker Jacks, 2 Bags of David’s Sunflower Seeds, 2 Cans of Jack Link’s Jerky Chew, 2 packs of Big League Chew, 5 Gummy Hotdogs, 5 Gummy Burgers, 8 BB Bats Taffy Lollipops, over 30 pieces of Baseball Gum, and – of course – a pack of baseball cards! Great gifts for baseball lovers, these are also a fun tin-o-treats to pick up for yourself. You can also grab one or two to offer up in a raffle or baseball fundraiser, or to serve as tasty centerpieces at a baseball banquet or baseball-themed birthday party!